I spent three weeks of hobby time getting these miniatures from sprue to plinth, sweeping all my ongoing projects aside to focus solely on these Sisters. The pressure of an immovable deadline and the harsh scrutiny of the judges meant I pushed myself hard to make the squad’s copper Vratine armour truly shine. Prosecutors in early November, broken into sub-assemblies and looking intimidatingly unfinished. The Prosecutors are each designed with one fixed pose – your only real choice is the way you point their head. Assembled out of the box, all have their Boltguns held across their chest. Reposing is a challenge, but with lot of cutting, putty and spare arms I opened up three of the poses to make the squad more action-packed. 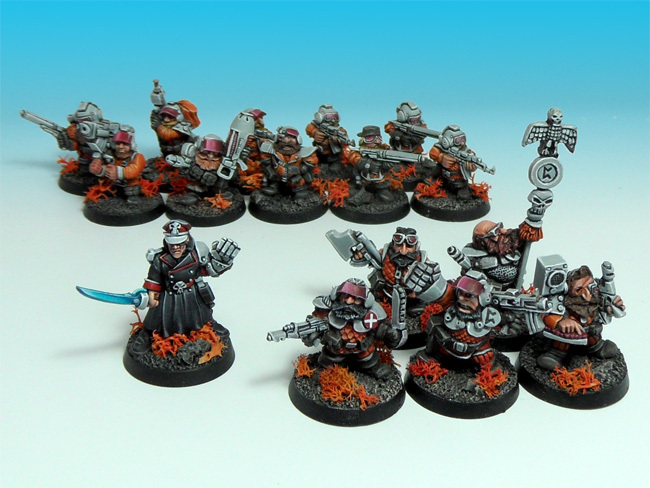 I was itching to introduce a bit of component variety into the squad, such as a heavy weapon, or a fancypants sword for the Sister Superior, but the Index Imperium wargear options forbade it. To get the squad to (silently) scream “LOOK AT ME” I added a massive banner from Wood Elf Eternal Guard kit. The original detail has been carved off and sanded away so I could paint on my own Adeptus Astra Telepathica designs on both sides. I wracked my brains for a phrase to freehand onto the banner. I considered Latin versions of “Enjoy the Silence” and “Hello darkness my old friend” – but tongue-in-cheekiness didn’t suit these dour space nuns. So I found two high-minded lines in Ovid’s Ars Amatoria which translate as “Slight is the merit on keeping silence on a matter, on the other hand, serious is the guilt of talking on things whereon we should be silent.” I’ll save the Depeche Mode for some goofy Rogue Trader or Blood Bowl nonsense. The ivy on the banner was originally a Captain Crooks suggestion. I used swirly ivy creepers on the breechcloths and cloak outsides, and angular ivy leafs on cloak insides. In folklore, ivy is taken into the home to ward off evil spirits much like Sisters are taken in your Imperial force to ward off evil. Aaaaand, ivy is mildly poisonous to humans, in the same way Sisters of Silence and their Pariah gene are psychically unsettling for humans to be around. I’m so happy with the symbolism of the plant that I might spin it out to the iconography of the whole Sisterhood Vigil (equivalent to a Space Marine Chapter), if I do any more. Call them “Crimson Ivy”? Mmm, no, too burlesque. “Ivy League”? Mmm, also no. The skullrific bases are from a Shadespire warband (Magore’s Fiends) with their footholes sculpted over. To ground them in the Warhammer 40,000 universe I added a helmet from a Thousand Sons Scarab Occult Terminator. Squad Philomela supporting the Nemesis Chapter battlelines. Last week the Patrons of Ninjabread got access to a detailed stage-by-stage write up of the paints and techniques used to paint the copper armour. If you become a supporter today and you’ll get access to this in depth masterclass tutorial, and also the back catalogue that also covers two varieties of Space Marines power armour, and human flesh. Thanks to everyone’s that signed up to date, I’m really enjoying spending the time sharing the secrets. Now the competition is over, and the intense focus has ended, I’m enjoying picking at preslotta odds and ends on the painting desk, toying with possible future competition entries. I need to blast through some gaming level paintjobs for a bitand get back to my Space Marine armies over the Christmas break. Watch this space! Dirty advertisement. Ninjabread continues below. They’re so great words are very unnecessary. These are delicious. That banner, lawdy that’s fine. A very well deserved win. Does the demon murmur gentle and soothing congratulations to you at night? Thanks! The Demon was whispering to me since I was a kid that I’d never be able to catch it. It’s silent now. P.S. Love all those poems you wrote. Oh my, the use of Ivy was a great way to link squad cloak and banner, also very fitting. Brilliant stuff and congratulations on a well deserved trophy! One day maybe… one day… i’ll have to retire so I can dedicate some serious time to improving my table top decent standard to GD Standard! Thanks Siph! I was tempted to creep some ivy across the bases, and bought a load of brass etch bits and Citadel Creeper vines. But AJ was quick to point out that ivy climbs traditionally climbs up rather than across, so I left it. Congratulation ? where do you store your Golden Demon? Thanks Nico! It will be going in the antiques cabinet in the front room so visitors can stare perplexedly at it. That banner is superb. A hulklean effort. That banner is seriously amazing, and I really enjoy the posing you have achieved with the otherwise very limited sisters. The use of open hands is particularly good, as it references the sisters’ conversational mode without beating you over the head with it. Man that banner… going to have to come back and look at that again later. I bought a Forge World Prosecutor Cadre upgrade set just so I had some more pose options available! 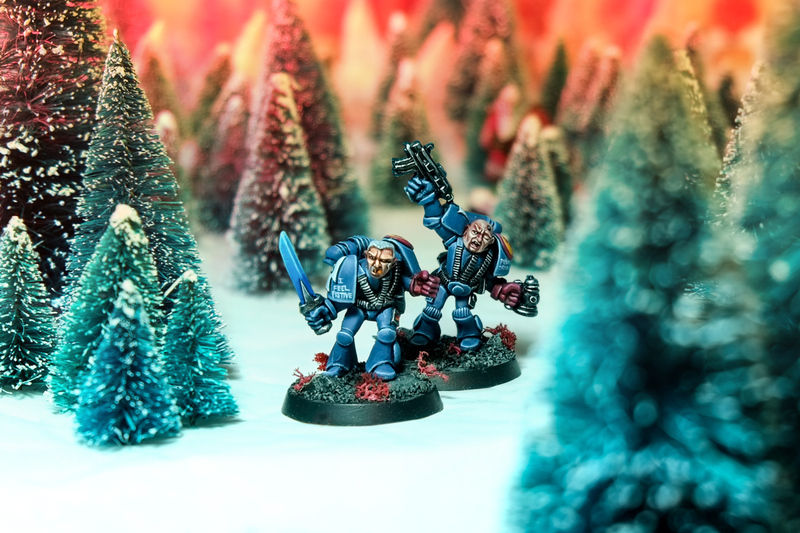 It was a bit odd as the versatility of earlier Games Workshop kits (like the Tactical Space Marines) let you do so much – yet with this kit you really have to fight and curse it to do anything. I feel like you have contributed to the world of art here. Absolutely amazing detail painted onto these figure. I can’t wait to tuck into the next tutorial. Bless. Thanks Sean. Next tutorial’s already underway, and I’ve got a practise model for the March one underway too! Exciting times. Success!! !, Thank’s to your GD winning minis my wife will stop asking me….I hope. I’m glad your painting skill has been officially recognised with this GD trophy Chris. Thanks Papa! There’s room in the market for tutorials aimed at all levels, (but I won’t tell your wife that). You’re level is already beyond the people that write the painting tutorials in White Dwarf, and yet they churn those out every month. Fanks! Awed into silence! Literally. Thanks Warburton! I had a lot of fun researching and executing the banner. Amazing! Sadly couldn’t get a good picture on the day because of the strong light on the top shelf! Thanks Anna! I was a little worried how they’d look on the day too with such strong cabinet lights and gloss armour. I took a lot of test shots of them under my strongest lamps to see what perfections the judges sould see. The guns all come with the left hand sculpted on. It’s a case of slicing it away with an ultra-sharp knife then sanding it back with fine wet-n-dry paper on a flat sanding block until you get a flat surface. Then carving out the bit where the groove is covered by the hand. And then reposing the right arm at the elbow and shoulder so it’s not held across the chest. I messed it up a couple of times and had to get a second sprue of Sisters for replacements Bolters. I’m proud of you every day, but today you get a comment. 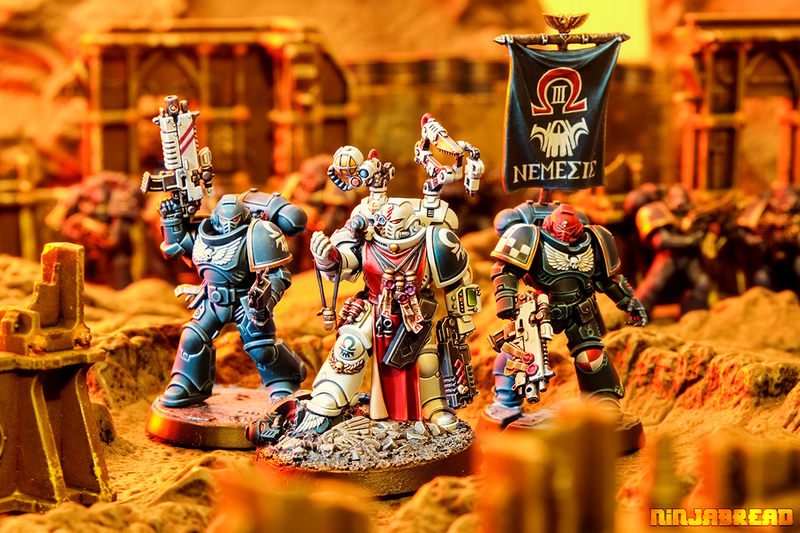 Amazing work on this squad – that Golden Demon is very well deserved! Love the reposing, the addition of the banner and also the narrative rationale behind the Ivy theme. Thanks Azazel! I initially went a little overboard with how much ivy I could load onto the models – and had the Citadel basing vines and some brass etch vines as well to pile in – but it ended up very quickly overloaded and I left them out in the end.